Yes, sentences are not only used in English class, but also in Math! In algebra a sentence contains numbers, variables, operations and either an equal sign (=) or an inequality symbol. 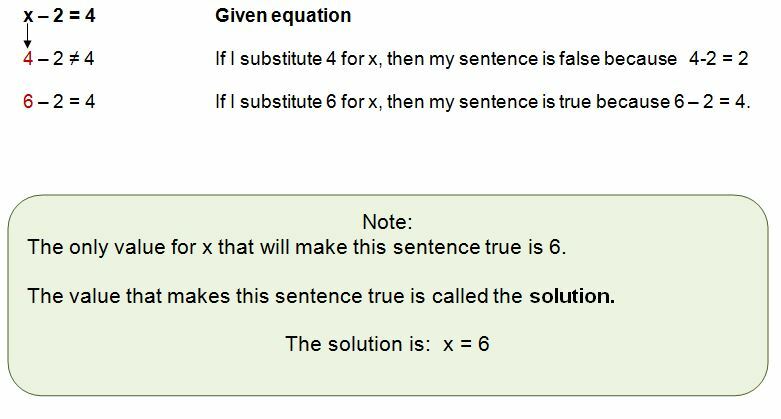 As you discovered in the example above, the equations (open sentences with an equal sign) that we will study in this unit (linear equations) only have one solution, or one value for the variable that will make the sentence true. Let's take a look at how you might find a solution for a sentence that is an equation (with an equal sign). Ok, so that's not too hard. You need to have great mental math skills to find the solution to open sentences. As you can see, there are many solutions when working with inequalities. 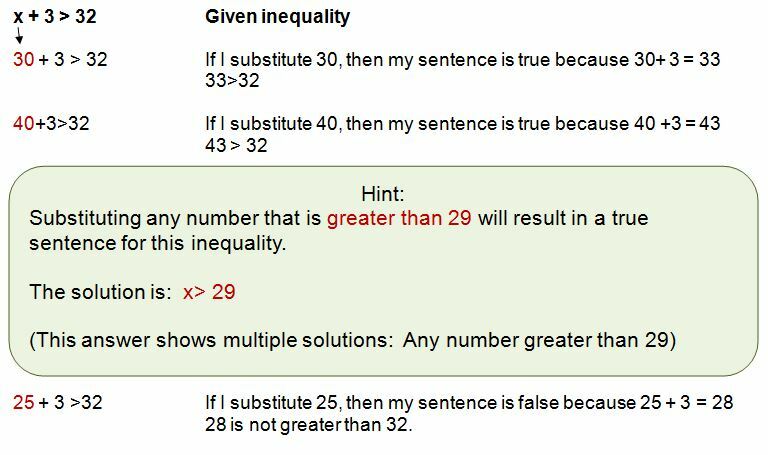 We can express all of these solutions by using the inequality symbol in our answer. If your mental math skills are not up to par, then you may have trouble finding solutions for these math sentences. When you use integers in math sentences, then finding the solutions can be really tough. Therefore, you may want to check out our lessons on solving equations. It's best to start with the lesson on solving addition equations. Algebra Class is designed to help all students who struggle with Algebra concepts. It's a perfect solution for middle and high school students, homeschoolers, college students, test prep studies or Adult students just looking to learn Algebra. If you need a more comprehensive study, of Algebra, the Algebra Class Ecourse provides video tutorials, practice worksheets, and step by step answer keys. Our website just got a new look! We really hope you like it! Please let us know if you can't find what you are looking for or if we can add any lessons that would be helpful for you. We always love new ideas for creating lessons! We are currently working on the radicals section of our website. Please be patient as we continue to build these lessons for you! Copyright 2016. Karin Hutchinson All Rights Reserved.